I have been performing professionally for 25 years. I perform many songs in many genres. I am an accomplished guitarist but also sing very well. 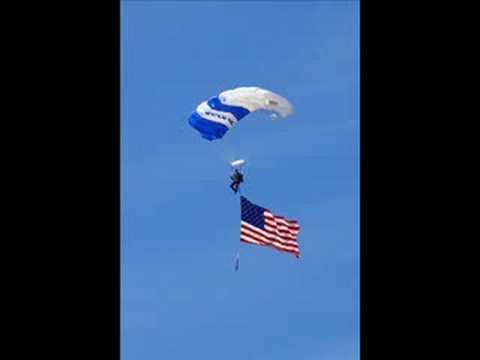 I can customize a song for your event if needed. I am highly professional and super dependable. 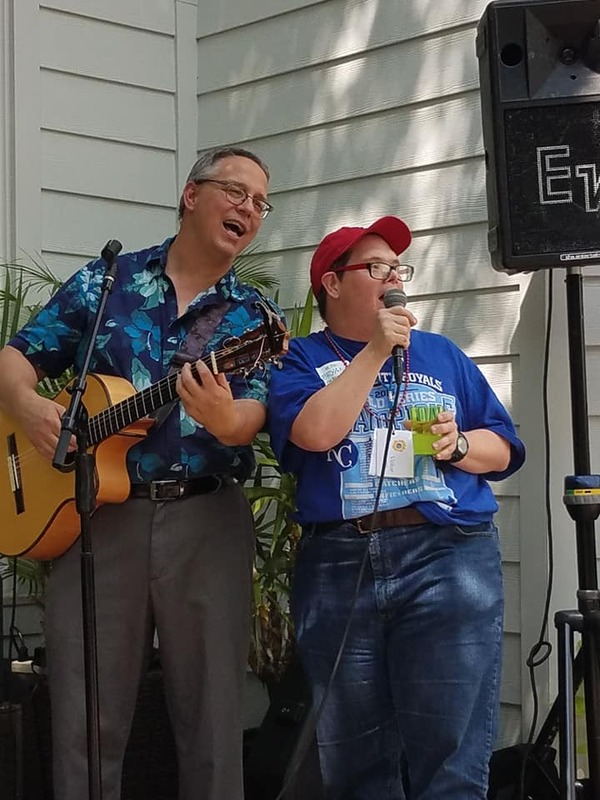 Chris Foster understood and appreciated the TENOR/VIBE of the event he was playing for (a 30th Birthday Celebration for a local medical safety net clinic); RAVE REVIEWS from attendees. Classy repertoire, all played (and occasionally sung) very professionally, very well. Lovely guy, lovely personality, also. Unequivocally a FIVE STAR MUSICIAN/PERFORMER. Dear Susan, I'm humbled by your words!!! Thank you! What a special moment with special people!! This is an annual event at our Golf Club and I have had many entertainers over the past years, however Chris Foster blew them all away. I was looking for some diversity and that's exactly what he delivered. 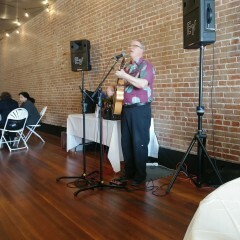 He played and sang songs from several decades. We had a hundred and sixty in attendance and so many of them congratulated me for my choice of entertainment. I will definitely book Chris again at my next event and I highly recommend him to anyone who is looking for great entertainment and music. Thanks, Chris. Humbling words thank you so much. What wonderful people!! I hired Chris for 2 hours and after hearing him play and sing I asked him to stay on for the rest of the evening. He was outstanding and made my party a huge success! Mara, what beautiful people you guys are. I loved every minute of your party!! Chris was wonderful. He is a very talented musician with a lovely voice. He also has a large catalog of music that he can choose from for your event. I would definitely hire him again in the future. Chris was the cherry on the cake! This was the note I sent to Chris after our event - I think it will work for a 5-star review: Chris - I can't even begin to tell you how incredibly special it was to have you entertain for Bryan's surprise 50th party yesterday. You absolutely made the party and were the crowning touch that made it perfect! 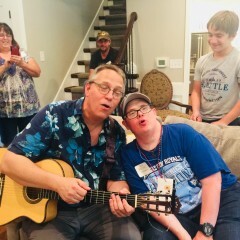 Thank you for your kindness in letting Bryan sing with you .... he was in heaven! Blessings to you you! Chris has a great voice, and a huge playlist; very adaptable, fun and charismatic! Thanks to GIG salad for proving an avenue in which we can find quality entertainment. Chris Foster was a wonderful addition to our family friendly evening with Kansas Ballet. We wanted to provide a relaxed vibe for our guests to enjoy their dinner before the performance. Chris is professional, talented and had a fun interactive approach to entertaining our audience members. Kansas Ballet is happy he was able to share his talent for the evening. We would highly recommend him for events and would hire him again. Thanks again for helping to create a magical evening and raise money for our 2018-2019 season! 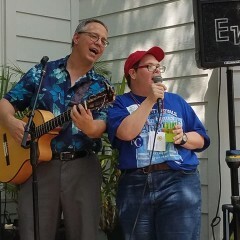 Chris was fantastic for my son's graduation party. He showed up on time, set up and played the type of songs we requested. He learned the names of people and incorporated it into his show. Beautiful voice and guitar playing. My only regret was that I only booked him for 3 hours. The time went too fast. I would highly recommend him for any event as it makes it feel super special. Thanks, Chris! We have a lot of future celebrations so I'm sure we'll be talking again! Thank you Deedee for your kind words. Your family was amazing. Jessica is going to do great things! 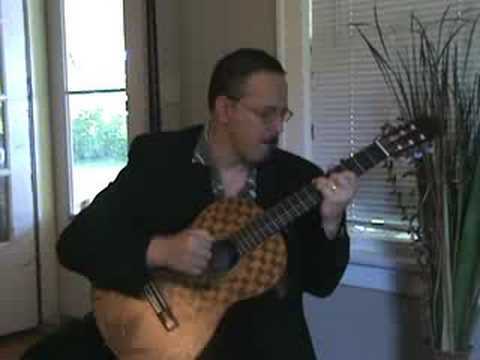 Chris did a great job playing acoustic guitar and singing at a family funeral. He was prompt, responsive, easy to work with, and was willing to learn 2 new songs with inly a few days notice. I would not hesitate to hire him again. Chris Foster's performance was excellent at my wife's birthday party. He has a great voice and is an accomplished guitarist-composer. Chris was very personable and funny. Everyone at the party enjoyed his performance. Two thumbs up! My residents loved Chris. They asked for him to come back monthly! Went out of his way to make sure I was taken care of! David, I'm humbled! Thank you for your kind words! This is the most meaningful review I've ever received! What a fantastic job at Anton's! Great mix of original work and covers. His improvised blues songs were my favorite songs. He handled it well when an audience member went on stage and sang with him. While I appreciate the wonderful review, I must confess that this applies to another performer in Kansas City of the same name. I never have performed at Anton's and I typically don't do Blues. I do not want to take credit for engagement that I didn't do and wanted to let you know so you can appropriately credit the right person. Chris was wonderful. Everyone enjoyed his songs. Chris has a strong, smooth voice...... We plan to have him back. Chris was so great, not only as a musician, but also he was very accomodating. We had a slight change in plans for the setup and he was flexible in moving locations, even after setting up all his equipment. I loved that he went around and introduced himself to our audience and added nice background music to our Member Happy Hour. We will definitely use him again in the future! Thanks, Chris! Awe thank you Staci. The pleasure was mine to meet such nice people. I will look forward to being there again!!! So glad we found Chris!!!! Chris was so easy to work with and very accommodating. He sounded great and played music that everyone enjoys- giving us the option to choose the music if we wanted. 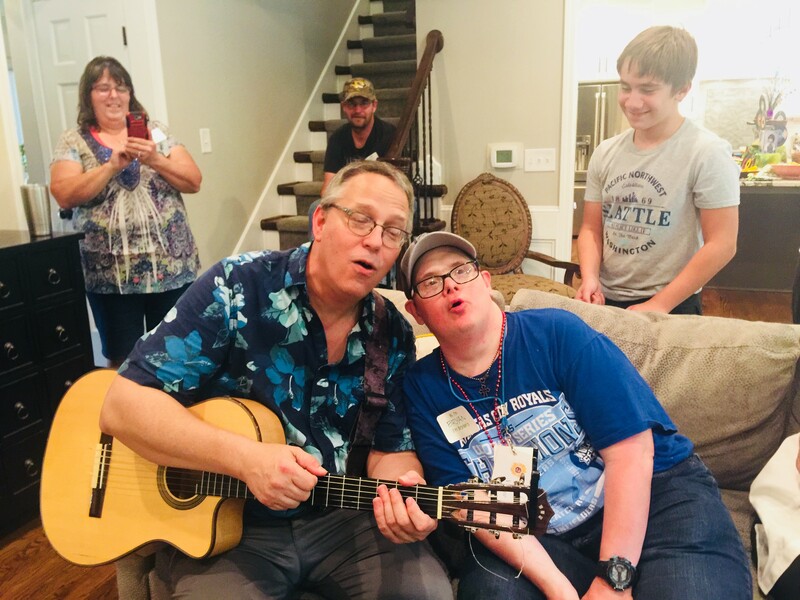 Having Chris play and sing at our party took the party to another level! It is my honor to have met you Maria and your wonderful group. I had a great time and I look forward to Future events which I can be a part. One of the great things about my work is meeting new people and making new friends. Your family is wonderful. Chris Foster was so much fun. His music was amazing,we were singing to all his songs, and we were all up dancing. Chris also had us laughing so hard! I would highly recommend him for any event, and can't wait to have him join us again! Chris did a good job and was well received. Thank you Dean. It was a blessing to be a part of your special event. Chris played our song for our wedding proposal a few days ago and did a fantastic job. He was professional, easy to reach and fair in price. The song was played beautifully and he sang it the second time around with a great voice. Thanks for making our special day so special. I was honored to be part of such a GREAT moment in your life!!! I am deeply touched that I could add to it. Your sentiment was sweet and you and your lovely bride to be have my sincere best wishes!! God Bless!!! Chris is wonderful to work with, and such a great musician. He was easy to communicate with and always helpful and responsive when we had questions. We requested "Sea of Love" and "You and I" for our processional and recessional, and Chris played both, and the other music that he played before and after the ceremony beautifully. It made our ceremony perfect. Thank you so much Chris! We couldn't be happier and we appreciated your time and talents. My special thanks to such a beautiful couple.Thank you for making me a part of your great day!!! 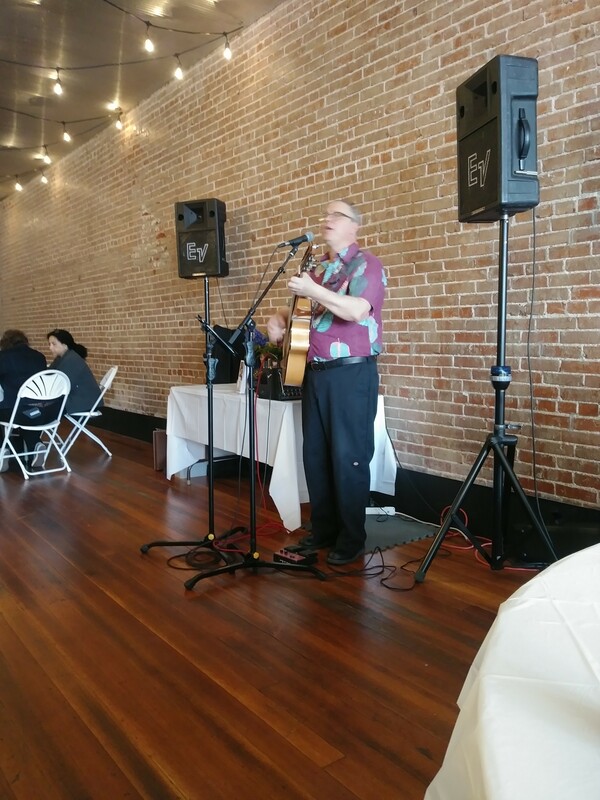 Chris Foster played at our wedding ceremony and reception, our entire family and our guests were so impressed! Not only did he bring his talent but also his wisdom. He provided a spare microphone for our officiant so that our guests could hear better and he provided a wonderful energy at our reception. He was flexible and patient and we were totally at ease because of the good vibes he brought. He learned the song we requested for our processional and it was played beautifully and made a special moment truly grand. We could not possibly be more happy and delighted with our experience. We wish we could give more than five stars! Thank you Ian and Ivey. I had a great time working with you. You're a lovely couple and I wish you the best. Chris is a consummate professional. Chris is very open and communicative with the audience and likes to have fun with them. He brings a light-hearted air to the event and people leave feeling happy. With over 4000 gigs of experience, he is well versed in handling any situation. 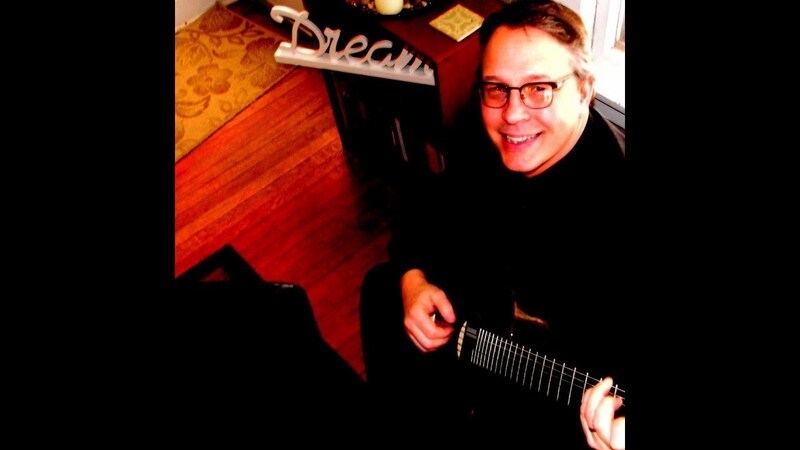 Chris has been performing music professionally for 25 years. He has logged over 4000 gigs to date. In 2011 his composition "Pirouette" was adapted for an 11 piece harp choir. In 2008 his song "Through My Eyes" was adapted for a Boy's Choir in England. In 2006 Chris and co-writer Stacey Knights WON the American Idol Underground songwriting competition (jazz category) with the song titled "Morning Monk". In 2006 Chris WON the Liberty Missouri Performing Arts New Artist Showcase. 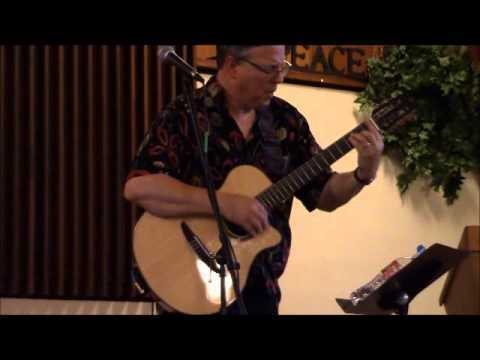 In 2004 he placed 2nd in SW Florida Folk Fest Songwriting competition. In 2003 he was recognized by the Government of Key West Florida for his Composition titled "Storm of the Century" and his musical depiction of the 1935 Labor Day Hurricane. In 2002 His song "Palma De Mallorca" was recognized by the King of Spain. He is noted for his great skill of guitar playing that is showcased on his Christmas CD and his Back To Brazil CD. Due to the sensitivity of my instruments it is not good for them to be in direct sunlight. So if I'm doing and outside job I need to be in a shady spot. An umbrella is sufficient in most cases.